With summer in full swing, we thought it a perfect time to find options for chilling wine. We searched some of the latest individual wine coolers and looked for relatively inexpensive ones. We tested for ease of use and practicality. 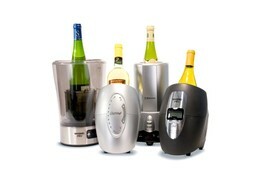 We liked that we can drop a bottle in these gadgets and have it ready in a few minutes. But we weren’t entirely convinced that they work better than our refrigerator, though our fridge can’t keep the wine at a constant, ideal temperature as the chillers claim to do. We tested single-bottle coolers for ease of use and practicality. Comment: Vinotemp’s chiller is dead simple to use. It has only two buttons that increase and lower the machine’s temperature. It also came with an insulation sleeve that slips on top of the bottle to maintain temperature while chilling. The product chilled our bottle of white wine in 20 minutes. (It takes about an hour and 15 minutes to chill a bottle of white wine in an average refrigerator and about 20 minutes for red.) And while the results were fine, it was unclear when the wine was ready and if it reached our desired temperature.